Jessica Ramer began writing professionally in 2000. She has been published in "Macrobiotics Today" and has also written "Charlie Does the SAT Math." Ramer is a Kushi Institute-certified macrobiotic instructor who holds a B.A. in mathematics and a M.A. in psychology from Florida Atlantic University. What Are the Benefits of Bean Sprouts? Which Fruits & Vegetables Contain Resveratrol? Seaweeds are not only eaten in Japan but also by indigenous populations in the American Northwest, New Zealand and parts of the British Isles. Rich in iodine, iron and many B vitamins, they are a valuable addition to the diet. Although seaweed consumption has many benefits, there are also some disadvantages as well. A 2009 study published in the "Journal of Toxicology and Environmental Health" examined the sources of mercury in the Korean diet. The single largest source of mercury was ocean fish, but seaweed also contained relatively high levels of this element. Even though seaweed is typically eaten in small amounts, on average it contributed more mercury to the diet than beans, eggs, sugars and sweets, potatoes, starches and poultry. The researchers did conclude, though, that this level of mercury consumption was relatively safe. A 2010 article in the "Medical Journal of Australia" reported that seaweed consumption can be linked to altered thyroid function. In one case, the breastfed infant of a woman consuming soy milk containing kombu, a type of seaweed, developed hypothyroidism. Two other infants developed hypothyroidism after their mothers consumed soups made with sea vegetables. 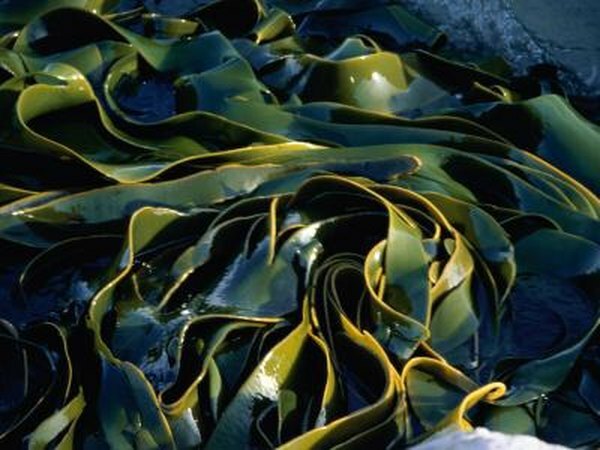 A Dutch medical journal has also reported a case of hyperthyroidism caused by excessive kelp intake. A 2010 study published in the "European Journal of Dermatology" found that Korean young people with acne ate more seaweed than young people who did not. Seaweed is a rich source of iodine, which was also linked to the development of this condition. It must be noted, however, that seaweed consumption was not the only difference between the two groups: The people with acne also consumed more dairy products, carbonated beverages and fat, while the people without it consumed more fish and vegetables. Another concern about seaweed is its arsenic content. Most of this substance is in the form of organoarsenics, which are less harmful than inorganic arsenics. A 2010 study in the "Archives of Environmental Contamination and Toxicology" found that these natural substances can be metabolized by the body into the more harmful inorganic form. However, tests measuring liver and kidney function showed that these inorganic metabolites did not appear to be harmful in small amounts.